Recently I finished the outdoor garden lighting, follow along while I make them QuinLED compatible and install them! 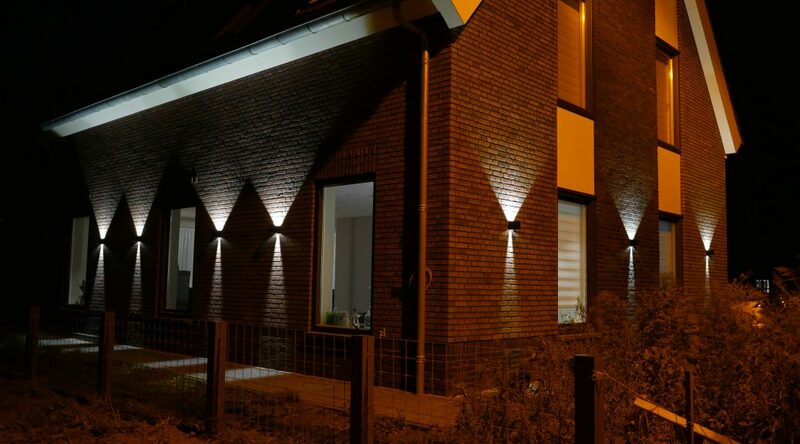 One of the things I planned during the build of the house was to have some lights on the outside walls of the house. I finaly got around to hanging these up and made 2 videos about it! The lights have been working great the past few weeks and even during harsh weather and lots of rain they haven’t failed once! Can you publish the links to the DC-DC converter used and the lights itself as also done in your other posts? I bought 2 of these lights. When i connect the 220v, i measure 37 volt coming out of the driver. How come you measure 18v? Are they connected in a different way inside the walllight? Yes it seems they are using different COB modules then. I don’t think QuinLED OG is going to be handle the 37 volts. You can try but I think it might fry the DC-DC converter on there. I am working on new designs of which one can handle up to 50v, that might be an option then. Those haven’t been released yet (I’ve talked about them on my YouTube channel already). When they are, I will update these pages also. ok, i have other buck converters, that go up to 40v. Only problem is they dont fit the board. Not a real big problem, as they are not visible anyway. These leds can driven from 300-500 ma at 10v, that’s why i measure 18v. Driver delivers 220ma, that makes around 500ma at 9v.